Game 3 duly arrived on Friday the 13th at the New Talbot in West Bromwich. Week 2’s match was rather fitting of the Friday 13th title and the players would hope to alleviate the mishaps of the previous league match event. Chips anyone? Tod had managed to find himself at the top of the leaderboard cometh week 2 in a role reversal of last season Could he continue this fine form? With the table so tight it was still anyone’s for the taking! 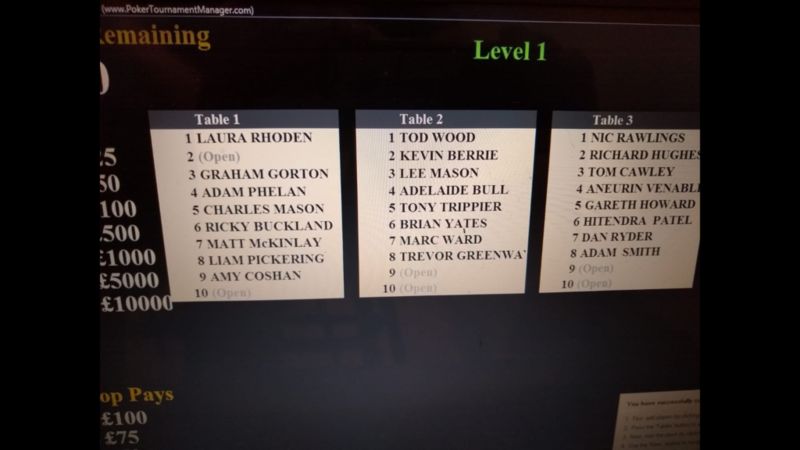 24 players made it to the game for the evening and the seat draw looked a little like this. In true Friday 13th fashion the mishaps had begun early. Rhoden’s face a pretty picture as her flopped straight ends up being the worst hand against Coshan’s full house. Unlucky Laura. Meanwhile Richard Hughes was getting excited at the thought of big arses; Subsequently tipping a pint over himself in the process, what a waste! 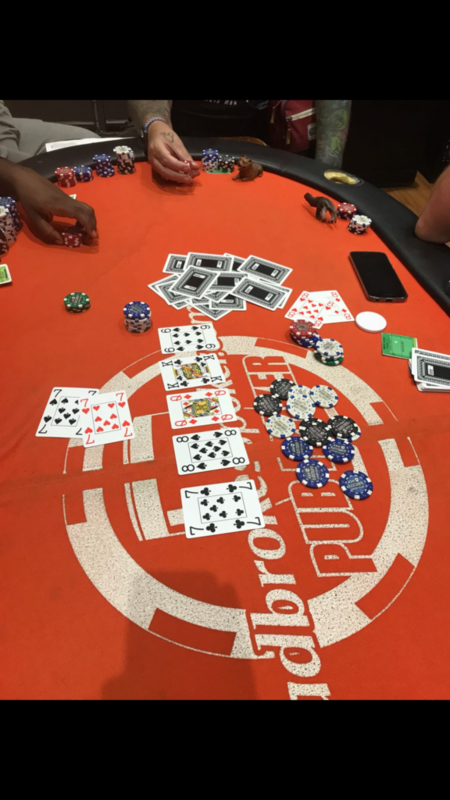 Chips were generously being passed between three players, how nice of them; Tod took a large chunk from Trev then Trev decided to recoup those back from Mason with 2 pair. With 20 players left Cawley managed a juicy triple up after the deal caused 2 players to start with pocket hole cards. Tom’s Queen King pitted against 4’s and Aces. 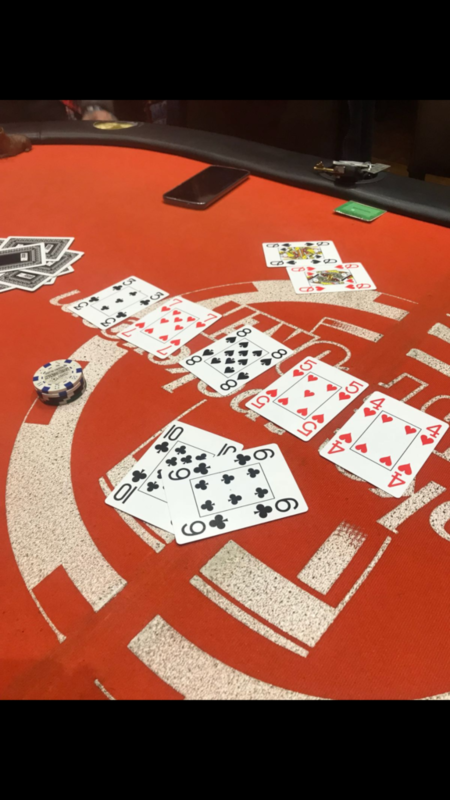 A King on the flop gave a glimmer of hope for Cawley then that dirty (or nice) river dependant on perspective can make or break dreams I tell ya! Queen anyone? By 22:00 the players were whittling down further still. Trev and Laura were eliminated as we pushed ever so closer to the exclusive final table. 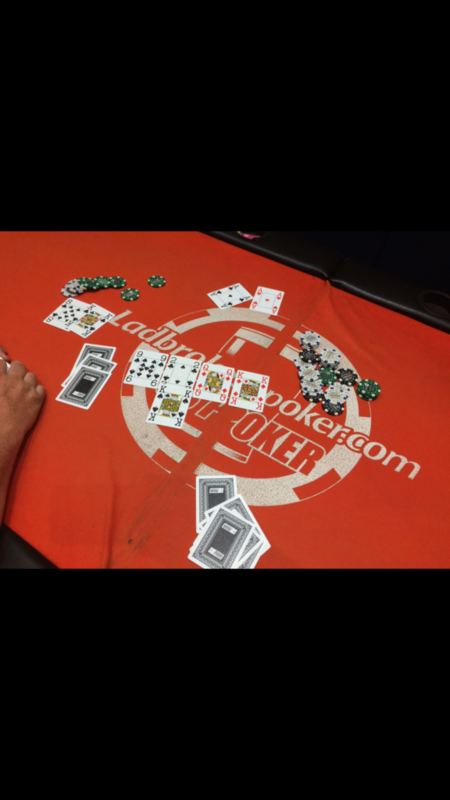 With 11 left at 23:00; Tod was putting in to practise some of the how not to play poker tips. Maybe for some payback on the previous 7’s vs 8’s hand? Out of position and repping the mighty 10 6 he led out on a 3 7 8 board. Not content with this he further calls off the all in by Brian and his armoury of pocket Queens with a gut shot chance. He’d need a 9 and a 9 only pretty much or some serious runner runner kind of thing. With Friday the 13th in full swing the bad luck was about to carry on with it’s demise but not for Tod! A 5 on the turn would open up open end possibilities and for good measure a 4 would present for the straight. Brian would proceed to put his umbrella down indoors and exit the game. Unlucky Bri! 30 Minutes later and H was a goner; Who needs Aces when you have King 8? H obviously didn’t throw the salt over his shoulder when he spilt that previously! 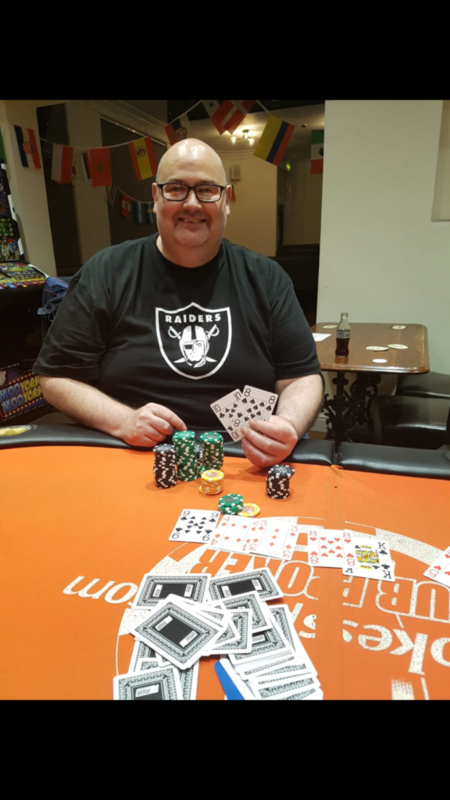 Unlucky H.
In 4th place we would have Mr. Wood who decided to raise 4 handed pocket Jacks and would then find an all in shove by Liam with A 3 off who proceeded to make his flush leaving Tod on fumes. The next hand Tod’s 2.3k would go in to the pot in a hit and hope but just couldn’t find a double up with the AQ vs A9 hand. A valiant attempt and 4th place for Tod. Liam would be out 20 minutes later in 3rd and the “How’d that happen?” question from Tod tends to suggest Liam was stacking. Well played Liam but tonight it would be between Mason and Berrie. The winner for week 3 though would be Mr. Mason who did just enough to finish off Kev Berrie and we had a winner! Big congratulations to Charles on his win and that has no doubt done him a World of good in the quest for that coveted BCPC trophy attempt. Who will be crowned week 4 winner? Tune in to find out! Remember to check out the calendar of upcoming games and events. Big thanks Tod for spreadsheet data and Brian for newsletter. 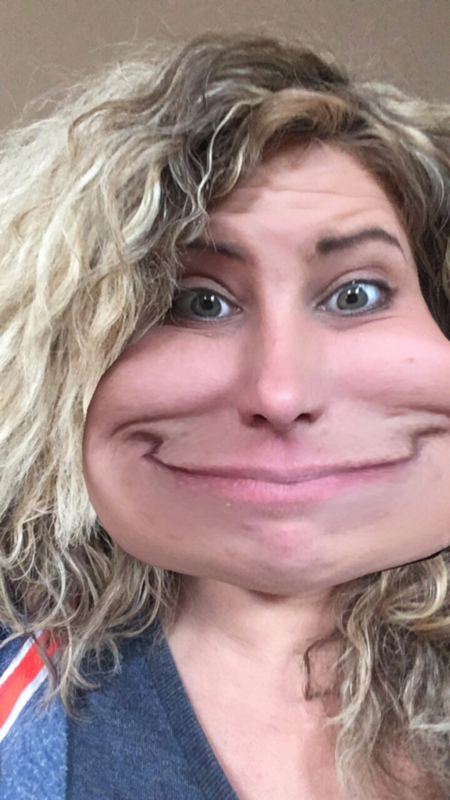 Remember to keep getting your pictures in the Whatsapp group for blog input thanks. 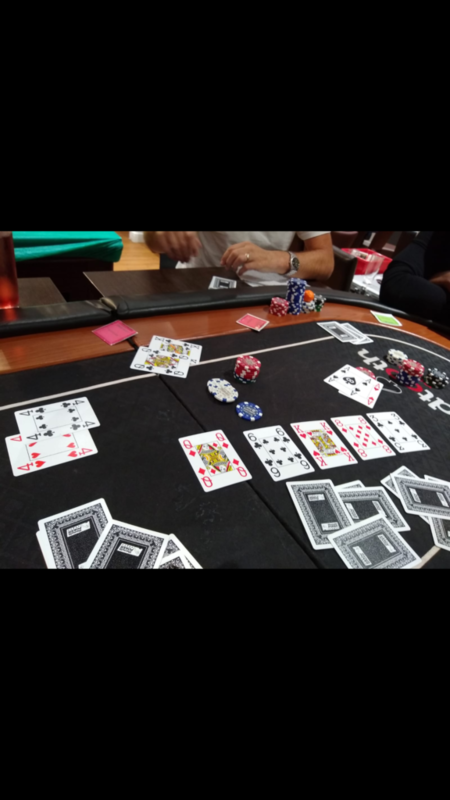 Also big game this Saturday on 21st July sees the Champion’s league BCPC vs Nuts Poker. Bring him home peeps! If you’re new to the club, have a look around the website. If you have any comments, please let me know.